The Future of Quality: Evolutionary or Revolutionary? In 1835, Alexis De Tocqueville, a French political writer, wrote his classic work, Democracy in America. His observations about America were a fascinating window into the times and issues of the day. Part of the power of his observations was his detached perspective. He could stay above the intense political currents, prejudices, and passions of the times and report on what he saw and heard. His writings still resonate today and tell us about the American character and culture. I am a little bit like Mr. De Tocqueville, abroad in a foreign land, albeit not as articulate, learned, or astute. In this case, the land is the quality community. As a newcomer to the quality field, I don’t have an insider’s grasp of the culture, language, or heritage, but I have a great admiration for your passion for quality. While being a visitor can be frustrating and confusing, I hope you will see it also gives me the advantage of a certain amount of objectivity. The quality community has many different constituencies, each with its own perspective. There is broad agreement on some things and sharp disagreements about others. One of the things I bring to this post is my respect for what you know and what you do. I came from a military background where you quickly learn that standards and certifications are serious business. Being in a field such as yours, where we also value learning, standards and certifications, feels noble and right to me, and I bring the advantage of a certain detachment from one particular quality perspective, which I hope will serve the community and ASQ well. One of my early observations is that I believe there are two very distinct views about the future of quality we need to at least acknowledge, if not actually reconcile. Evolutionary change: I would describe one view as the ascribing to evolutionary change. The quality movement has been immensely important and successful in many fields and will continue to grow and evolve, but will do so in recognizable and well-defined ways. We will move down traditional paths but reach new destinations and make new inroads into fields that are underserved today. We will keep doing what we do well and find ways to do it even better. I predict a lively debate in the days ahead and I look forward to reporting what I see and hear among you who hold the keys to our future in your hands. In the meantime, what do you think? How will the future of quality unfold? – Evolutionary change starts from childhood with daily Evergreen Training (Followers) ending up with continuous daily small incremental improvements. – Revolutionary change starts from adulthood with Vision and Creativity (Non Followers). Add big step improvements on top of the baseline daily improvement. You cannot make the best Today Quality out of a mechanical typewriter! Welcome aboard. It’s good to have you at the helm of ASQ. I like your measured and reasoned article. You’re right. The question is do we want evolutionary or revolutionary change. The former is more comfortable with expected results. The latter can be disruptive, be uncomfortable at times, and with unexpected outcomes. At the end of the day, there is probably no one right answer. It may be be a combination of evolutionary and revolutionary change. Interestingly, I think that we’re seeing this quandary in many organizations, associations, and even professions as they deal with the same pressures. Thanks for sharing your thoughts. I really enjoyed them. After reading your article, I started to consider what exactly is evolution and revolution on a personal level, how that translates to small groups, to business functions, to whole businesses, to industries, and to countries. Then I thought about how the changes in perceptions and expectations faciliated by the speed of communication and information sharing drive evolution and revolution back down through governments and industries, to business practices, to how functions and groups operate all the down to the individual. Frankly, I feel that evolution AND revolution occur concurrently depending on where you stand, and what your point of view is. I submit that the C suite is primarily interested in drving shareholder value, itself driven by sales on the top line and cost reduction/efficiencies on the bottom line. Higher level managers are squeezed to produce more value and productivity to achieve this increase in shareholder value. Some do this intelligently, and apply methods and tools we are all familiar with. Some choose to muscle in the cost reductions and productivity gains. The former takes longer, but produces sustainable results that can be measured. The latter is quicker and takes less thinking, but can be the beginning of the end for some businesses. I have witnessed both sides of this personally. And one does not have to look to hard to find cases studies and lessons learned about what happens when we do not take the necessary steps to craft a rational plan to anticipate the change in the market and how it changes the business model and strategy, before one finds themself and their shareholders….lagging behind. One thing is clear…what we consider evolution today and speed of it, would possibly be called revolution about 30 years ago; and the agility to adjust to new conditions through implementing products, services and other solutions quickly and compliantly will differentiate those that thrive from….the rest. And the quality profession can lead the way in this…perhaps it could be called a revolution in how we apply strategy to what is focused on and why we focus on it, and then how it is best focused on to drive the agility needed to survive. I too am one new to the field. In February 2013 our President asked that I take my skillset as a Program Manager and apply them in the role as our Quality and Continual Improvement Manager. I quickly discovered why he did this. Previous management’s approach had created a culture of where Quality was the enemy. The procedures were used too often for finger pointing instead of working to determine why there was a failure in our processes. We’ve turned the ship and now Production, Supply Chain, and Quality are working together and sharing ideas on continual improvement. However, we’ve realized a traditional approach to quality isn’t the best. As you noted we need to tie what we’re doing continuous improvement wise to what the “C-Suite” needs. We’re in the process of benchmarking against companies with successful quality programs that are meeting all of their organizational needs. We’re also researching through articles (in magazines like QP) and books to find what has been failure paths and success paths for others. Our journey is well underway, but as with any continuous improvement, it will be an ongoing journey. I look forward to reading more about what others think. Quality is an outcome which means it is after the fact, if you want to improve the quality of a produced product you have to work on it again which is “Waste” correcting error. So to have a quality product producer needs to work on the “Input or Process” in other word improve Operations. When you do this based on a set of defined (customer approved and accepted) requirements and specifications then you will have a quality product….which “conforms to customer defined standards”. So no one can improve Quality but Operations “Input and Processes” to produce quality product. The present time and the current context, in my opinion, offer better expectations and scenario for Quality to succeed if we promote perception, feelings and emotions. I think that our best strategy right now is to emphasize the “soft” side of Quality. I support a revolutionary model, based on Deming’s system of profound knowledge. We must work more with the heart than head, and must be willing to risk with the conviction that the results and benefits not only will be netted against the initial investment but even will multiply. Generosity, humility and respect are core values. I completely agree with your “revolutionary” statement that we need a different approach to sharing our knowledge if we, as an organization and as quality leaders, want to make a broader impact. At the WCQI in May, I came up with a new model for increasing awareness and perceived value of ASQ (and potentially increasing revenue) by exposing certain portions of the QBoK content outside of ASQ for free. I’ve already shared the outline for this with a handful of staffers and member leaders. I hope we’ll have the chance to discuss it in person at the November TCC / SAC meetings. Feel free to reach out if you’d like to hear about it before then. I support your efforts Greg. Keep up the good work. We need to make promoting the practice of better management the unquestioned priority. Hording knowledge inside a barrier does not help us improve the practice of better management. While the reach of quality may expand to “fields that are underserved today”, and/or “some of the ways we brought value to our businesses, industries, and communities will have to fundamentally change” one thing will remain constant: we have to be able to convincingly demonstrate that doing the right things right the first time will create an environment where profitbale, long term growth is likely. The force that “right thing” values such as honesty, safety, and environment responsibility exert on an organization correlates directly with that organization’s profitability. I don’t see the profit motive being supplanted, but until it is widely believed by the “C-suite” to be the result of doing the right things right the first time, it will retain it’s negative aura in the minds of many. In my opinion, the answer to the question is LEAN. Such a concept and philosophy connects and facilitates synergy, sharing, engagement and commitment of top senior executives. To promote the understanding of the Quality concept as a tool and resource necessarily inclusive (almost, as a requirement) in all sectors, companies and (the most important) each particular job, and not so much a science under the exclusive dominion of certain “quality” people and departments. Popularize quality, understood as a key strategy that helps to ensure customer loyalty and therefore assures survival (and pursues excellence) of the person, company, country .. I believe that to contribute at the highest level, we need to emphasize innovation. Quality has moved continually upstream over the years, from inspection to process monitoring, design of experiments, Six Sigma and Design for Six Sigma. The next step upstream is innovation. As the ad states, it is innovation that excites now. I encourage membership in the ASQ Innovation Interest Group, which seems to be growing rapidly. Good reflection, however in order to evolve we have to evolve our minds. From a traditional, unsymmetrical and slow thinking to a dynamic, symmetrical and fast thinking. Go to http://www.asqhdandl.org under primer look at wellbeing. The biggest barrier to overcome: dysfunctional mental models. Within organizations, mental models constitute integral elements of organizational cultures. When business deals with business, there tends to be a common sharing of values and culture. (From Bureaucracy to Hyperarchy.. LRJones, Fred Thompson). Good thought provoking. In my view as new technologies emerge and impact our lves and society Quality profession and strategies and supporting tools will evolve. Also quality professionals need to deploy their skill sets to social issues such as starvation, clean potable water etc. Thank you for your comments, everyone! Your interest is much appreciated! Your feedback was shared with Bill. Thank you very much for your thoughts on Quality and more specifically on the future of Quality. As you started off with Alexis De Tocqueville, I would also like to start in the past. By now you will have heard of W. Edwards Deming as one of the gurus of Quality Management. His 14 points for the transformation of Western Management are still referred to a lot. Note the word “transformation”. Deming wanted the CEO’s of this world to start talking the language of Quality and fundamentally change the way we do business. A call for a revolution, one might say. But somehow, somewhere, we have lost this ambition to fundamentally transform. Now we say that quality has to speak the language of the CEO. We have decided to become servants (I am even tempted to say slaves) to a quantity dominated economy. Quality as a tool, no longer a strategic imperative. And we are pretty much irrelevant. We have no influence on Wall Street or the City in London or any other financial or economic platform, we are actually totally absent from all important decision centers. And we will continue to be so unless we find our ambition back to focus on fundamental aspects: creating a quality based economy and society, focusing on quality of life of all people. Focusing on what real people experience as quality in their lives, both professionally and personally. And debating about systems that jeopardize this quality of life rather than about the sixth word of the seventh paragraph of the new ISO 9001 standard. Great Article – and thought provoking. Revolution? Evolution? often depends on where you are, where you want to go and whether you see your environment in chaos and in need of strong immediate change or one that has been successful but inspired to be better. Each is appropropriate – but as Q professionals we must choose what message we are promoting and appreciate not only the intended outcome – but the response from the various types around us. BTW – Q professionals who weren’t constrained by only influencing the processes producing their core products or services, frequently applied their skills to a ‘Best for Business’ approach. Nothing Revolutionary about that. Type A leaders (control) lead with the carrot & stick but many companies under type A leaders don’t achieve long term results. There is a lot of evolutionary thinking there. 3M & Google are under a different styles of leadership. They get more top line results by embracing the breakthrough ideas of their staff. It’s not that disruptive when time is allotted to nurture breakthrough ideas. This type of thinking also get the attention of the the C-suite. For now the breakthrough companies are way ahead of the game. It’s appropriate to frame progress of Quality change in historic terms. We build on the past with a view to the future. How we get there will likely be a combination of inches and lurches, subtleties and the dramatic, with some change from within but driven by public demand. I think the future of quality is a mix of both. I want to thank each of you who responded to the post. I especially thank you for your words of welcome. I loved hearing your thoughts about the future and learning from you. Pere Marcé Franquesa’s thoughts on the soft side of quality really intrigued me. One thing that came through to me is a desire to see this discussion continued and broadened. 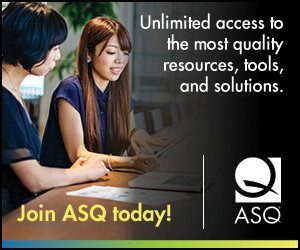 I think ASQ members want many others to enter the discussion about the future—including the thought leaders, many of whom offered their own insights. In light of that, I would like to offer two steps. First, I plan to regularly come back to this subject, with, I hope, fresh ideas and insights. Second, I want to let you know we are about to embark on our next Future of Quality Study. With the help of experts, academics, executives, and practitioners, we plan to identify the top five most important and relevant future trends and then solicit a “quality” take on each of those five trends. I will write more on this shortly but I am now even more enthusiastic about this project. Thanks again for your comments! I have worked in the quality field for thirty years and like many of you have witnessed first hand the series of changes that a company goes through as it evolves from very basic / elementary quality control to obtaining ISO registration. I realize each point of view is subject to debate however, it has been my observation that no matter where you go or what type of business or industry you’re engaged with, before any evolution, or revolution for that matter, can occur there must be complete buy-in / commitment from the top and more than that top leaders must have clear vision and purpose for why they want to achieve whatever their specific goal or mission is. As a conservative, I believe that just like parents raising children, it is the leaders place / role / responsibility to set the stage for development which will ultimately ensure the best possible result or outcome will be achieved. The laws of nature have provided us with all we need to know. In every family (business) unit the propensity / possibility for good and or bad genes exist. These variables will influence the individual decisions and or behaviors of those which make up the family unit, but caring / responsible leaders / parents will work to ensure that all that can be done will be done in an effort to ensure the best possible outcome and future for that which they love and cherish. Control your future by influencing the present. Think out side the box, think inside the box, become the box. Previous Previous post: July Roundup: What's the Purpose of Vision? Next Next post: August Roundup: What's The Future of Quality?